Mondesi's House: How Bout Them Panthers? Say what you want about the Pitt football program; they deserve their share of slings and arrows. But I think people sometimes forget that the school has slowly evolved into one of the country's most consistent basketball programs, a program that was on display again Monday night versus #3 Syracuse at The Pete. 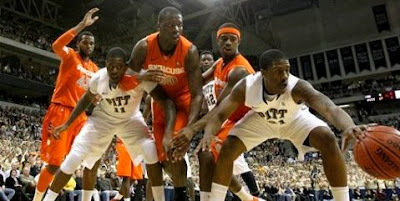 In front of a national ESPN audience, Pitt raced out to an unreal 19-0 lead, then watched as the 'Cuse pulled themselves together and rallied to close the gap to 19-17. But in a game of runs, the Panthers ended up on top at the final buzzer, coming away with a 74-66 win against the previously-unbeaten Orange, now 18-1 and 5-1 in the Big East. Jamie Dixon's team is now 18-1, 6-0 in the Big East, and getting their praises sung by analyst after analyst as the lead on Monday's SportsCenter. Let's hope their heads don't get too big after this latest W. And if they do, Dixon should pop in a tape of the Tennessee game to bring them back down to earth. Currently the #4 team in the country, Pitt is now 8-1 in their last nine against Syracuse, handing the Orange their first loss of the season for the second year in a row. But the most exciting stat is Pitt's 9-0 mark in the Petersen Events Center against Top 5 clubs, with this being the second such win this season after their takedown of UConn. In front of an arena record crowd of 12,925 that included James Farrior, LaMarr Woodley, and Larry Fitzgerald, the Panthers got 21 points from Nasir Robinson and 15 from Brad Wanamaker. Gary McGhee added 13 rebounds, and Wanamaker led with six assists. CJ Fair led Syracuse with 16 points in the loss. The Panthers are currently 2nd in the nation in rebounds per game and 1st in assists per game, to go along with the nation's 17th-ranked offense at 80.3 points per game. Their next contest won't come until Saturday when they travel to DePaul for a game with the 6-11, perennially disappointing Blue Demons. *19-17, I believe? Pitt had a run of 19 then 'Cuse followed with a run of 17. Big Ben was there, too. First Pitt game I've managed to catch this year. The opening two runs were something that I don't think anyone's ever seen.